For a little more than four years, one of the first things I do in the morning is put a necklace around my neck. Now this is not a gold necklace, and wasn’t bought in a store, but it is priceless to me, due to a couple of reasons. There’s actually two necklaces there, the first one has the keyring on it and it held the key to my jail cell around my neck instead of it being on a string. I took a lot of heat, and still do, for my support of The Leafs due to their poor performance, but I stand by them and wore my self-made necklace quite proudly for my whole time in jail. So in this picture, you can see the five individual colours. I’ll explain them, but they’re gold, yellow, dark blue, light blue, and pink. Each colour holds a special significance and the five together represent what is most important to me in my life. I came to this realization while I was in jail, alone, and missing people. And of course, the CROSS represents JESUS CHRIST. 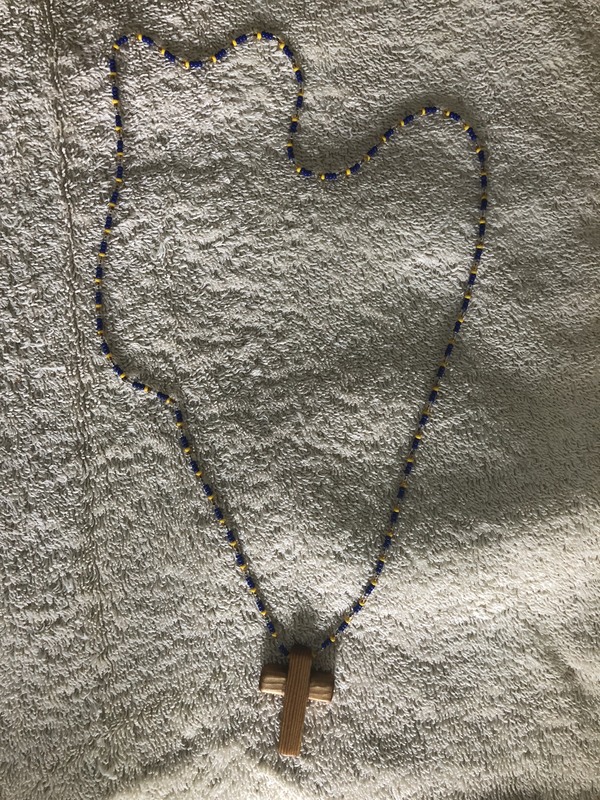 Since I made the necklace, about 1/2 way through my jail sentence, I’ve worn it every day and when I don’t have it on, something is missing from my life. Very few people know, at least until now, how significant this necklace is to me, but it has deep meaning and I’ll wear it forever. My one fear is that at some point, I’ll either lose or break it, but I hope that doesn’t occur. The designs were intricate and time consuming, but I had a lot of time to spend. Some of the Aboriginal inmates found it amusing that a “white guy” was spending so much time beading, as it was considered something that the Aboriginal inmates did. But I actually enjoyed doing it.